Mary Poppins is the ultimate Broadway “family musical,” with music and lyrics by Robert & Richard Sherman, George Stiles, and Anthony Drewe, and a script by Julian Fellowes. It was adapted from the Academy Award-winning 1964 movie by Walt Disney and contains all of the familiar songs. It debuted on Broadway in 2006, received nominations for seven Tony Awards, and ran for 2,619 performances before it closed in 2013. 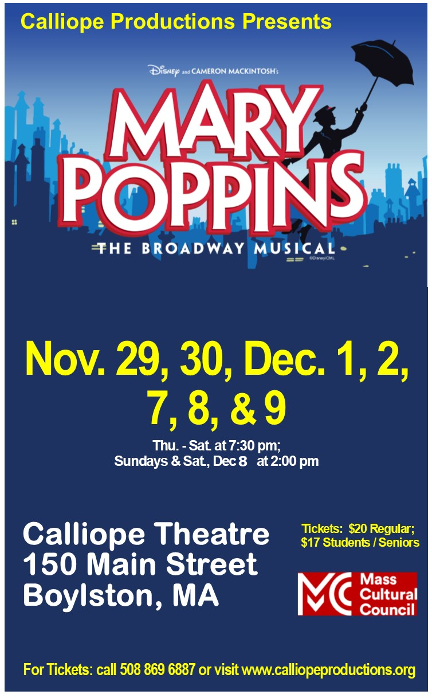 Call the Calliope Box Office at 508-869-6887 for ticket availability.